Another week, another giveaway on CineSportsTalk.com! 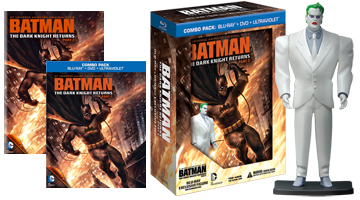 This week we are giving away a copy of the Limited Edition: The Dark Knight Returns Part 2 on Blu-ray w/ exclusive Joker figurine. Who played the BEST Batman and why? I think Bale played the best Batman. Nolan’s scripts had a lot to do with how the character was to be portrayed but Bale has always pulled off disturbed without effort. Batman is the person, Wayne is the mask. Batman has always been a disturbed individual and arguments of him being the same as the Joker has always been essential in many of the fantastic stories in the comics. Bale’s expressions as he’s training with the League of Shadows, the way he moves his body with such conviction as he’s nailing the Joker’s men in the abandoned building, the way he looks as he pushes his crippled body to put the suit back on after all those years; Bale makes the audience believe he’s insane and completely convinced that running around in a bat suit with bat themed weapons is what the city needs; pretty much the equivalent and antithesis of the Joker, giving us the perfect depiction of Batman. Of course, being a method actor probably helped him own the role, but own it he did with such precision. Kevin Conroy is a VERY close second though, until Nolan’s series, I was convinced the animated series in the 90’s was the closest we’d get to see Batman in motion!